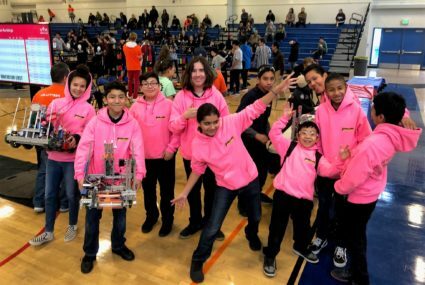 BALDWIN PARK – Holland Middle School seventh-grader Jason Aldana reported how much time was left on the tournament clock as his teammate drove their robot into battle during the North Hollywood VEX Supernova Spectacular Robotics Competition on Jan. 12. Aldana is the Link on Holland’s X Team and his role is to ensure his teammates know how much time they have left in the round. Holland Middle’s competitive robotic career kicked off during the 2017-18 school year with one active team. Since then, the program has expanded to include three teams: The A Team is a six-member all-female eighth-grade team; B Team consists of seven eighth-graders; X Team is made up of five underclassmen. The Bulldogs meet every day for a semester-long automation and robotics class, a course offered through Project Lead The Way (PLTW). For the robotics club, the students meet every day after school during the week leading to a competition. “It’s not just a club, it’s a way of life for these students, and it is also, for some of them, a career path,” Holland Principal Mike Rust said. Tom Lau, a science teacher and PLTW instructor at Holland, serves as the head coach of the robotics teams. Alongside Rust and assistant coaches, Lau helped pilot the 2017-18 robotics team to multiple victories. “Getting to see the previous Holland robotics team go on to compete at the high school level is amazing and it is great to see how everybody has grown up and matured,” Lau said. With the arrival of the Holland alumni, Baldwin Park High School grew its robotics program and incorporated a second competitive team. Baldwin Park High School’s teams include a five-student upperclassmen team and the eight-member freshman team of Holland alumni. Romo, project manager on the freshman robotics team, wants to attend San Diego State University and become an aerospace engineer. BPUSD_ROBOTICS_1: Holland Middle School has expanded its robotics program to include three competitive teams: The A Team is a six-member all-female eighth-grade team; B Team consists of seven eighth-graders; X Team is made up of five underclassmen. Teams B and X will compete in the Robotics League Finals Saturday, Jan. 26 at Pico Rivera STEAM Academy. Holland Middle School has expanded its robotics program to include three competitive teams: The A Team is a six-member all-female eighth-grade team; B Team consists of seven eighth-graders; X Team is made up of five underclassmen. Teams B and X will compete in the Robotics League Finals Saturday, Jan. 26 at Pico Rivera STEAM Academy.